Step 1 Preheat oven to 350 degrees F (175 degrees C). Prepare asparagus by trimming woody base and cutting diagonally into 4 inch pieces. Step 2 In a roasting pan, combine asparagus, bell pepper, mushrooms, roasted garlic and tomato. Sprinkle with rosemary and oregano, then drizzle with olive oil. Bake in preheated oven for 15 minutes. Step 3 Bring a large pot of lightly salted water to a boil. Add pasta and cook for 8 to 10 minutes or until al dente; drain. 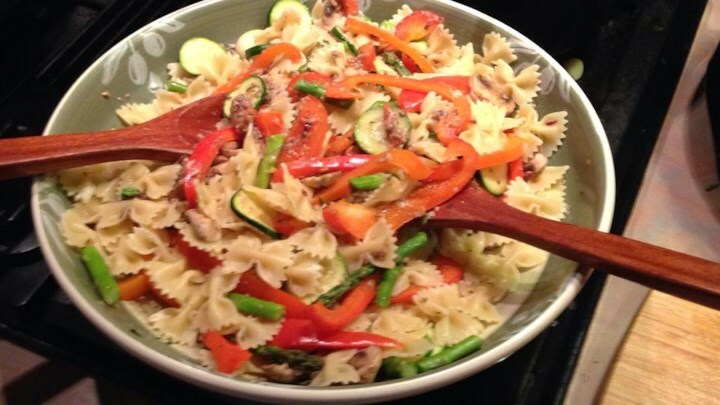 Toss with Parmesan cheese, tapenade and roasted vegetables.